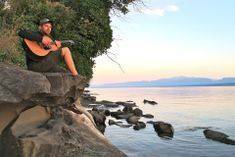 Steve Doreen, an emerging luthier based in Victoria, BC will have his hand crafted custom made ukuleles on display at the Nanaimo Ukulele Festival on both Saturday, July 15th and Sunday, July 16th, 2017. He specializes in custom hand crafted boutique guitars and ukueles but is well equipped to repair your much loved string instrument as well. Steve creates unique and beautifully sounding instruments made from domestic and locally sourced westcoast woods. Don’t miss the opportunity to chat with Steve about your next instrument built with your own design specifications. Check out his website www.stevedoreenguitars.com or his facebook page Steve Doreen guitars. Contact info: email: stevedoreen35@hotmail.com or 250-419-3759. That is such exciting news. I love my Steve Doreen baritone ukulele. Beautiful.